Learn more about nature, wildlife sightings, and more at River Legacy. Mushrooms are really interesting organisms. 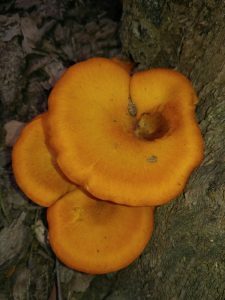 They are neither plant nor animal but rather belong to an entirely different kingdom of life called fungi, which actually also includes pathogens (such as athlete’s foot), molds, and yeasts. Despite being very distinct, they do share characteristics with both animals and plants. They are sessile like plants but do not produce their own food, something they have in common with animals. The mushrooms themselves are really only the spore-producing (fruiting) body of the organism. Lurking beneath the mushroom is a network of filaments that compose most of the fungus. They are very important decomposers and can also be a great food source for a lot of animals. Spring is a really good time to find mushrooms because they start appearing everywhere once there is enough water around. 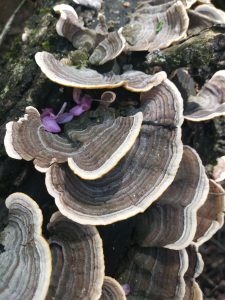 Here at River Legacy, there are many species to be found, from oyster mushrooms to turkey tail mushrooms, jack-o-lanterns, puffballs, shelf mushrooms, carbon ball mushrooms, and many more. As you can see, mushrooms are a very diverse group and some can be quite beautiful. We invite you to come out to the trails at River Legacy this spring and look for mushrooms growing in the forest! Mammals, Reptiles, and Creepy Crawlers, Oh My!